except in the light of evolution." Application of available software tools to biological problems. This duality, i.e., a combination of methods development with biological applications is beneficial to both directions, as we frequently find that existing approaches do not give satisfactory answers to specific biological questions. Thus we develop new methods to fill the void. The availability of experts biologists in our group to validate the results of new approaches, in turn, stimulates methods development. 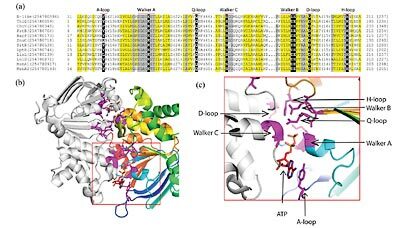 What is the most important unsolved problem in computational biology of proteins? Apparently, it is protein energetics. 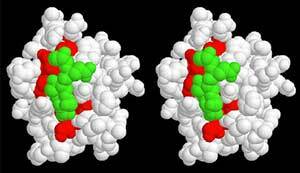 1) The protein folding problem (i.e. prediction of spatial structure from sequence; 2) the precise modeling of interactions between proteins and of proteins with other molecules; and 3) the quantitative understanding of enzyme catalysis — are all various incarnations of the same challenge. Despite significant achievements in the field, an exact solution from the physics perspective is still far from reach. Bioinformatics approaches offer practical shortcuts to these problems. 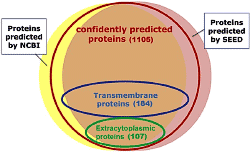 Deduction of protein properties (i.e. 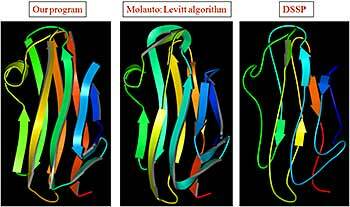 3D structure or function) by homology to proteins with known properties has been the most successful application. For this method to reach its full potential, the following steps should be perfected. 1) find homologous proteins, i.e. do a database search; 2) compare them to the protein of interest, e.g. make an alignment; 3) decide on the boundaries of property transfer by similarity, i.e. at what level of similarity a property is shared between homologs, and thus can be deduced without experimental characterization. Most projects in the lab deal with these questions. Homology and evolution are the central themes of our research. By homology we mean similarity caused by common ancestry, not just any similarity. Proteins are homologous if they originated from a common ancestor. Similarity caused by other reasons, e.g. structural constraints on 3D packing, is termed analogy. When similarity is weak, distinguishing between the two scenarios, homology vs. analogy, is challenging. We are working on this problem. The long-term objective of our research is to classify available protein sequence-structure data into a biologically relevant, hierarchical system analogous to the one currently used in zoology and botany, and to provide computational tools to establish and maintain this classification. Since sequence and structural similarities usually imply functional similarity, such classification would provide an indispensable tool for biologists to aid in experimental design. Applying a combination of various approaches is usually best for addressing complex problems. Thus the questions we pursue are quite diverse and can be summarized as follows. Our publications give more specific ideas about research directions. Additionally, we are involved in many collaborations to study individual protein families, predict properties of proteins, help interpret the effects of clinical mutations and assist in data analysis–driven experimental design. Below are short descriptions of projects and main results. Protein structure classification is necessary to comprehend the rapidly growing structural data for better understanding of protein evolution and sequence-structure-function relationships. Moving towards the goal of classifying all proteins, we focused on small domains: zinc-fingers and disulfide-rich modules, and several other protein classes (e.g. kinases and thioredoxin fold proteins). Change of functional site location in homologs: Serine protease inhibitors in the BPTI-like family perform the same function using different, non-homologous regions in their 3D structures (magenta). 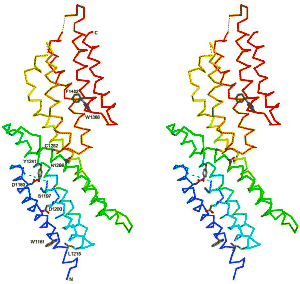 Structural comparisons of representative treble clef fingers: (left) – the steroid hormone "estrogen" receptor DNA-binding domain showing two treble-clef domains; (middle) – prolyl-tRNA synthetase; and (right) – RPB10 protein from RNA polymerase illustrate the wide range of variations in the structure, such as circular permutations, structure deteriorations and replacement of β-strands with α-helices. 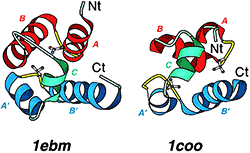 Zinc-binding sites are nevertheless conserved. Proteins of different structure classes can be kinases: a) α/β – UMP/CMP kinase, b) all-α – Dihydroxyacetone kinase, and c) mostly β – Riboflavin kinase. It illustrates that a given chemical reaction can be performed by completely different structure types. Thioredoxin fold: (a) Topology diagram: dotted loops indicate the termini positions of the four types of circular permutations that we observed. 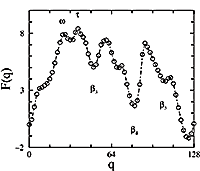 (b) Query meta-matrix of type I circular permutation in the thioredoxin-like fold. Growth of superfamilies and folds with solved 3D structures: Growth rate remains approximately linear despite the exponential growth in the number of solved structures. 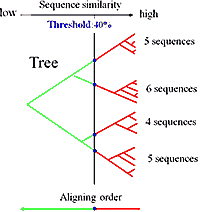 Highly connected sequence families are more likely to be solved. Inset: fraction of families with solved structure as a function of number of sequence similarity links. Homologs arisen by duplication. Two duplicates in glyoxalase. 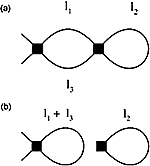 Each duplicate has topology βαβββ. A natural way to study protein sequence, structure, and function is to put them in the context of evolution. 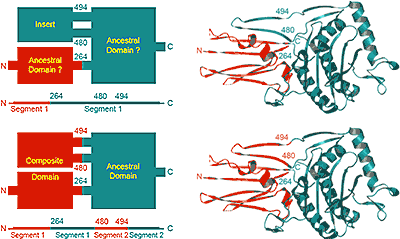 Homologs inherit similarities from their common ancestor, while analogs converge to similar structures due to a limited number of energetically favorable ways to pack secondary structural elements. 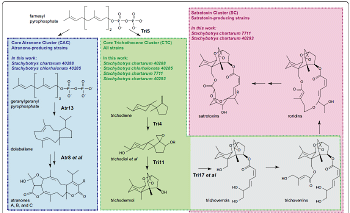 Using novel strategies, we assembled two reliable databases of homologs and analogs. Hybrid motifs mean analogy. Two proteins on the right: (b) and (c) are homologs. 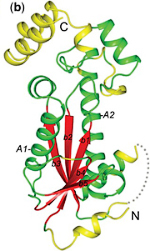 Red insertion in protein (b) forms a hybrid motif with part of the core (yellow frame). Thus, two proteins on the left: (a) and (b) share analogous motif framed yellow. SVM at work: Blue plane divides yellow points and red points. Fold change from SasA to KaiB. Rearrangement in structures is due to amino acid substitutions. To study the mechanisms and paths of protein fold change in evolution, we undertook a comprehensive comparative analysis of SCOP (Structural Classification of Proteins) domains and found domain pairs with significant sequence similarity (measured by HHsearch probability), but pronounced structural differences (measured by Dali Z-score). 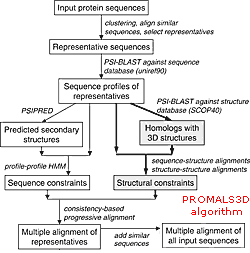 For all representative domain pairs, the reasons for the discordance between the sequence similarity and structural dissimilarity were studied and classified into three categories: (1) problems with the sequence or sequence alignment; (2) problems with structure or structure alignment; (3) events of interest for protein evolution and biology. 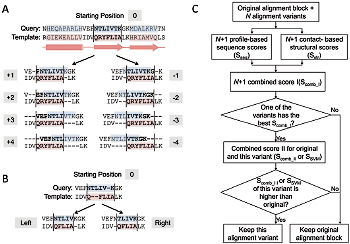 We find that, on the one hand, dataset of structurally different proteins with strong sequence similarity is plagued with various technical problems, which encompass over half of representative domain pairs and make the examination a tedious task. These problems arise at all stages, from experiment (genetic construct, structure determination) to data processing (generating PDB file and SCOP domain) and data analysis (profile, alignment, structure superposition). On the other hand, careful investigation reveals interesting examples of homologs with distinct structures and advances our understanding of protein evolution. We see that insertions, extensions, and duplications decorate and expand evolutionary core; deletions reduce the core, sometimes beyond recognition, potentially resulting in reorientation of structural elements. Topology and mutual arrangement of secondary structures may change due to circular permutation or domain swapping. Finally, combination of several such events makes for the largest structural differences between homologs. Structural similarity between Cre recombinase and MarA: Ribbon diagrams of a Cre recombinase from bacteriophage P1 (1crx) and b MarA transcription regulator from Escherichia coli (1bl0). Proteins are quite promiscuous in ways they change functions in evolution. Some enzymes lose active sites and become binding proteins, while binding modules gain active sites and become enzymes. A few examples are mentioned here. 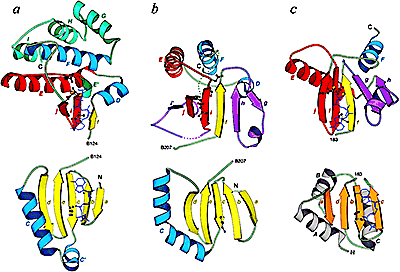 Homology between homing endonuclease and MH1 domain of Smad: a homing endonuclease I-PpoI from Physarum polycephalum (1a73), b human Smad3 MH1 domain (1mhd) in complex with DNA. c structure superposition and d structure-based sequence alignment of endonuclease I-PpoI and Smad3 MH1. 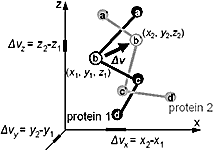 A coarse-grained model recapitulates statistics of protein evolution. Composite domain is formed by interacting inserts and/or domains. Disorder propensities we optimized correlate much with Nozaki-Tanford transfer energies (a), but do not correlate well with Kyte-Doolittle hydropathy scale (b). 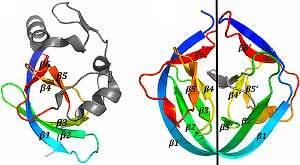 Most protein structures are folded as semi-regular arrays of parallel and anit-parallel secondary structural elements. It is possible to approximate locations of secondary structural elements in such structures as points on a hexagonal 2D grid. The resulting topology diagram is a succinct description of a protein fold. Interactions between neighboring secondary structures and handedness of connections between triplets of secondary structures uniquely determine the correspondence between the topology diagram and real protein structure. 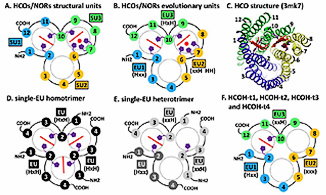 We exhaustively enumerate topology diagrams for small number of secondary structures (3 to 8) and find proteins that contain these as substructures. 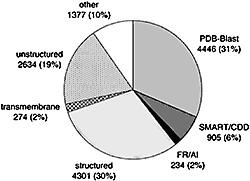 Each diagram is converted into a ProSMoS meta-matrix, and PDB database is searched with it. The results show highly non-random distribution of real structures by topology types, and symmetric, simple and regular topologies are more abundant in proteins. 3D and topology diagrams of several common protein folds can be found here. Reducible diagram: (a) two pairs of cross-linked fold blocks; (b) reduction to independent loops. φ-value plots (a) and free energy landscapes (b and c). ABCG5 (left) and ABCG8 (right) transporters. The mutations detected in patients with sitosterolemia are indicated. We are collaborating with several research groups to understand the molecular effect of disease-causing mutations. Four examples, all from the Hobbs lab, are given here. ARH protein. Mutations associated with autosomal recessive hypercholesterolemia are shown. PCSK9 Model with mapped mutations (colored spheres). Structural model of wild type and mutant PNPLA3. Mapping disease causing missense mutations that exist in protein domains with known structure can shed insight into the alteration of protein function and its impact on disease. We have collaborated with the Brugarolas lab to interpret such missense mutations that occur in renal cell carcinoma (RCC). The nuclear deubiquitinase BAP1 is inactivated in 15% of clear cell RCC and a novel germline mutation in the gene predisposes to familial RCC. We constructed a BAP1 structure model based on related Ubiquitin C-terminal Hydrolase (UCH) family members Uch-L3 and Uch37 to understand missense mutations that map to the catalytic UCH domain. Two of the mutations that did not abrogate BAP1 expression (p.G13V and p.P170L) disrupted side chains implicated in either an intramolecular interaction with the ULD domain (Gly13) or ubiquitin binding (Phe170), and highlight the importance of these interactions for tumor suppressor function (PDF1 ). The same model was used to interpret the BAP1 germline mutation (p.L14H) that predisposes to familial RCC. Leucine 14 maps to the first helix of the UCH domain and is physically adjacent to two previously identified pathogenic RCC mutations. The altered position helps organize a crossover loop and other flexible portions of the UCH domain that order upon ubiquitin binding, and forms a portion of the interaction surface for the ULD tail. Mutation of this residue to histidine is predicted to increase the effective volume of the side chain, possibly causing steric clashes with surrounding residues, and may prevent productive ubiquitin bindind (PDF2 ). What can be more exciting than discovery of molecules with novel activities! Computational analysis may point to the right candidates. MBOAT family sequences from mouse. FIC motif with secondary structures (α-helices) shown below. C3PO is a new RNAse. Trax contains catalytic residues (magenta). 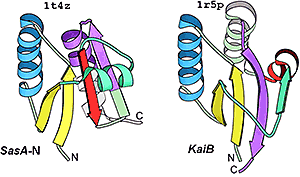 Novel proteins with WIRS motif. VPA1380 is related to the IP6-activated cysteine protease domain of MARTX and CGT toxins. Vibrio parahaemolyticus is a Gram-negative halophilic bacterium and one of the leading causes of food-borne gastroenteritis. 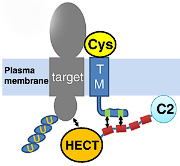 Its genome harbors both Type III Secretion Systems (T3SS) and Type VI Secretion Systems (T6SS) that deliver virulence effector proteins into target cells. We have collaborated with the Orth Lab to shed light on the function of several of these effectors. We helped identify a conserved bacterial phosphoinositide-binding domain (BPD) that is found in functionally diverse T3SS effectors of both plant and animal pathogens that delivers effectors specifically to the inner membrane of host cells (PDF1 ). Using comparative proteomics, we identified two previously unidentified T6SS effectors that contained a conserved motif. Our bioinformatics analyses revealed that this N-terminal motif, named MIX (marker for type six effectors), is found in numerous polymorphic bacterial proteins that are primarily located in the T6SS genome neighborhood. Several of the MIX-containing proteins functioned as effectors that killed neighboring bacterial cells. Thus, our findings identified numerous uncharacterized T6SS effectors that can lead to the discovery of new biological mechanisms of bacterial warfare (PDF2 ). The Orth lab also identified a T3SS2 effector protein (VPA1380) that is toxic when expressed in yeast. Our bioinformatics analyses revealed that VPA1380 is similar to the inositol hexakisphosphate (IP6)-inducible cysteine protease domains of several large bacterial toxins. 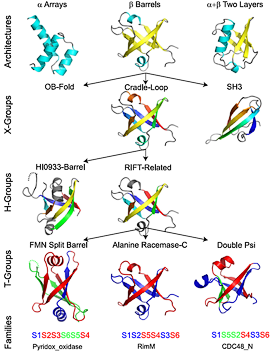 Structure modeling, combined with sequence conservation analysis suggested mutations in conserved catalytic residues and residues in the putative IP6-binding pocket that abolished toxicity in yeast. Furthermore, VPA1380 was not toxic in IP6 deficient yeast cells. Therefore, our findings suggest that VPA1380 is a cysteine protease that requires IP6 as an activator (PDF3 ). Protein kinases constitute one of the largest and functionally diverse gene families, with members representing almost 2% of the human genome. The protein kinase catalytic domain is conserved in sequence and numerous structures have been solved, revealing an active site at the interface of two lobes. Conserved sequence features that contribute to the active site include a glycine-containing loop and an ion pair in the N-terminal lobe, as well as an ion coordinating aspartic acid and a catalytic aspartic acid in the C-terminal lobe. In collaboration with the Dixon Lab, using these features and sensitive profile-based sequence detection methods, we identified a group of secreted kinases that are distantly related to the protein kinase-like superfamily. 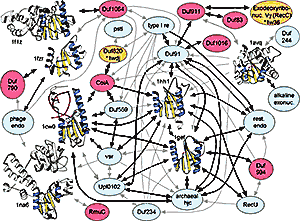 One of these kinases, Fam20C, is the physiological casein kinase and phosphorylates a diverse array of secreted substrates (PDF1 ). 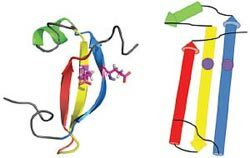 We have also used knowledge of the catalytic protein kinase structure/function to help understand the mechanism of cancer causing mutations in the protein kinase MET (PDF2 ), to help understand drug sensitivity and resistance in tumors (PDF3 ), and to help identify activation mechanism of JAK2 (PDF4 ). We spend quite a bit of time analyzing individual protein families with the goal to further our understanding of their evolution, structure and function. Several semi-randomly selected examples of our work are given here. 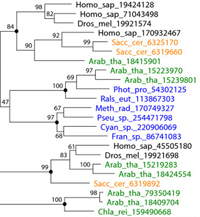 Sequence conservation in pII Superfamily: Groups (I-V) are rainbow-colored by conservation from blue (least) to red (most). 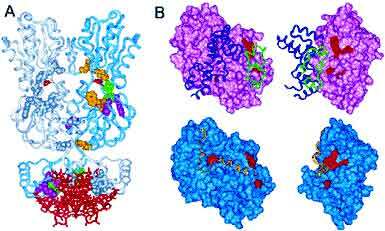 Diverse O-linked GlcNAc transferase homologs: (a) glycogen phosphorylase, (b) glycosyl transferase MurG, (c) ribosomal protein S2. Thioredoxin-Like Fold. 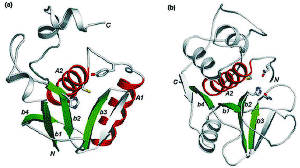 COG3019 rosetta model (A), disulfile oxidoreductase NrdH (B), and E. coli arsenate reductase ArsC (C). EDD domain-containing families Dak (A) EIIA-man (B) and DegV (C) compared to tubulin GTPase (D). S2P Models: transmembrane helix topology (A) and active site (B). Longin-Like Fold Conservations. Longin domain interaction with small GTPase (A) compared with mapped Duf254 family (B) and CHiPS family (C) conservations. Fic domain diagram and structures. ABC transporters in Candidatus Liberibacter asiaticus. Structures of GAIN-B, ZU5 and Nup98-C domain. Predicting phenotype from genotype represents the epitome of biological questions. 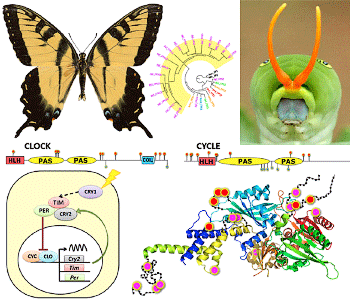 Comparative genomics of appropriate model organisms holds the promise of making it possible. To tackle this problem, we are developing methods and applying them to sequence, annotate, and analyze complete Eukaryotic genomes. Example of structure prediction made by COMPASS: Invariant Glu residues are marked with red dots, glycine-rich loop is circled. 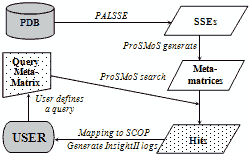 Profile-based similarity search is an essential step in structure-function studies of proteins. 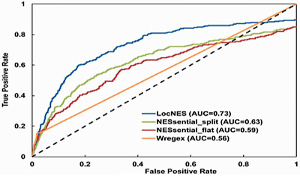 However, inclusion of non-homologous sequence segments into a profile causes its corruption and results in false positives. 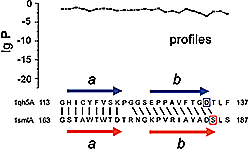 Profile corruption is common in multidomain proteins. One major source of profile corruption is from extension of alignments over non-homologous sequence regions. 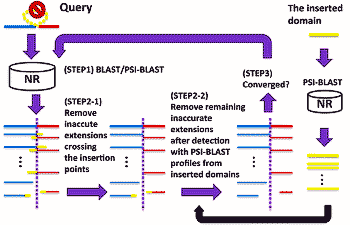 For instance, for two 2-domain proteins, AB and A’C, PSI-BLAST may extend a correct alignment of the homologous domains A and A’ to include sequences from the non-homologous domains B and C. Despite significant effort devoted to this multi-domain problem, no satisfactory solution exists. Currently, the best approach is to start PSI-BLAST with precisely defined query sequence bounds However, we found that even a single, well-defined domain does not guarantee a corruption-free profile. Domains hosting insertions, which represent close to 5% of domains in the SCOP 1.75 database, may generate a corrupted PSI-BLAST profile due to incorrect alignment extension around the insertion position. We developed a procedure (HangOut) that, for a single domain with specified insertion position, cleans erroneously extended PSI-BLAST alignments to generate better profiles. PSI-BLAST alignment can be divided into two segments: (1) correctly aligned and (2) incorrectly aligned or extended. These incorrectly aligned “overhangs” are detected and removed by the HangOut program to clean the profile and prepare it for consequent remote homology searches with various tools, such as PSI-BLAST and HHsearch. When tested on all 302 SCOP domains harboring inserted domain. PSI-BLAST profiles show corruption in 30% cases (91 domains). All but one HangOut profiles are free from corruption. The single exception is due to distant homology, since both the host and inserted domain represent similar doubly wound Rossmann folds. Although our current HangOut method does not offer a comprehensive solution to the multidomain problem, it addresses a special case of domains with insertions that represent the major source of profile corruption when PSI-BLAST is initiated with single, discontinuous domain queries. Stereoimage of grouping results: Location of each protein in this 3D projection is shown by its number, colors show different groups. SCOPmap finds homology between (a) protegrin-3 and (b) cystatin despite domain swap resulting in low sequence and structure scores. PALSSE is more robust to variations in structure while defining secondary structural elements compared to DSSP. Although multiple sequence alignments (MSAs) are essential for a wide range of applications from structure modeling to prediction of functional sites, construction of accurate MSAs for distantly related proteins remains a largely unsolved problem. Over the last few years we paid significant attention to the problem and developed four MSA programs. Although plethora of methods for structure alignments exist, the problem of finding equivalent residues in weakly similar structures is not solved. Many factors are considered when experts make manual 3D superpositions and alignments derived from them. 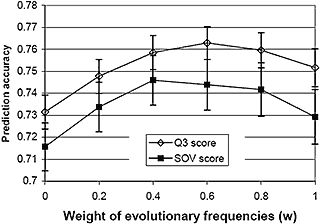 Spatial proximity is not enough to produce biologically meaningful alignments. In our algorithm, we are trying to emulate an expert, and to combine superposition strategies with intramolecular contact-based approaches. We try to maximize the number of superimposed residues under the constraints of matching H-bond patterns and side-chain orientations in β-sheets, plus a few key contacts between β-strands and α-helices. 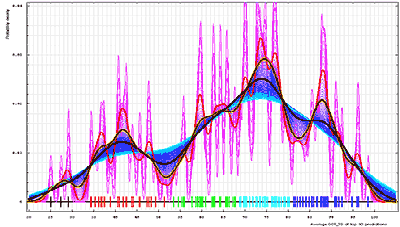 Quantification of statistical significance is essential for the interpretation of protein similarity. To address this, we work on statistical model for sequence and structure comparison. A new statistical distribution, pEVD, precisely fits the distributions of simulated profile similarity scores. The distribution's tail and its best fits with Gumbel extreme value distribution (EVD) and with pEVD are shown. Positional P-values reveal structural shifts in homologs: Structure alignment (marked by slashes) contradicts high P-value sequence-based alignment. 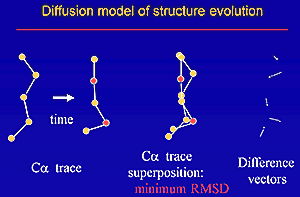 Difference vectors Δv in minimum RMSD superposition were the starting point in our approach. where x is RMS deviation of coordinates in a superposition of two structures (random variable), k and s are parameters of the distribution and Γ is Euler Gamma function. Stereoview of PDZ domain: ligand shown in green and functional residues predicted by ANCESCON and colored red. A. PurR family transcription factor; B. G-protein α-subunit. We worked on development of approaches to side-chain modeling, sequence design and local structure prediction. Profile scores for designed (black) and natural (gray) sequences. Local structure prediction improves when evolutionary and structural information are combined. Summary of structure prediction for proteins encoded by the male-specific region of human Y-chromosome. 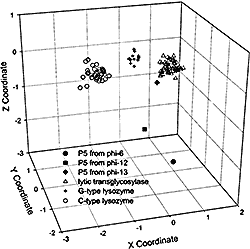 Other work in this area was aimed at predicting structures from various protein families. GGDEF/cyclase domain: a adenylyl cyclase, b sequence conservation mapped on GGDEF model (left) and adenylate cyclase structure (right). γ-GCS and GS superfamily: a segment from an alignment. Target category assignment: Quality of server predictions can be used to define target categories using this kernel PDF estimate. Top models compared to top template. Flowchart of evaluation protocol: Homology detection and alignment quality are evaluated in reference-dependent and -independent fashion. Compression in models: Right - structure, left - model.